Don't fall over now, but I actually found time to finish and photograph my 5 large (14") bears for the show this weekend! All bears are available on a first come basis when the doors open at the show this Saturday. However, if you see a bear that you like and are not able to attend, drop me an email. If that bear is still available after the show, then I will contact you first before putting him up on the website. If still available after the show, the adoption fee for most these bears is $165 including US shipping. (add $10 for shipping out of the US) Happy is an open mouth bear, and his adoption fee will be $180. 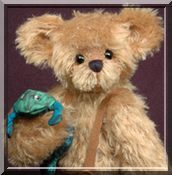 Chicagoland Teddy Bear Show THIS Weekend!